We are constantly updating our range of songs, ensuring we add the newest and most popular tunes to our vast and growing repertoire. The latest list can be downloaded HERE as a pdf file. We must warn you it is quite a long list! Kick It Entertainment wish it could be Christmas every day, but because it isn’t, we want your Christmas party to be the best party ever! Why not bring your Christmas party to the office? Kick It Entertainment can provide a DJ with all equipment to fit inside your office, big or small, day or night. The DJ will play the latest tunes, funky disco, dance floor fillers and those all important Christmas crackers. 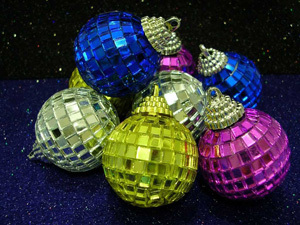 We will also supply your office with those must have party poppers, with our compliments (50). Alternatively, if you would prefer to use a venue, we can supply you with a Christmas party to remember. We will even throw in some cheesy music for good measure. ‘Hey Macarena’! Kick It Entertainment provide a large number of DJs for New Year’s Eve, so it’s not too late to book your party with us. Whether it is a pub, club or private function, Kick It Entertainment has a package to suit you. We will supply a DJ and all equipment to make your party go off with a bang, including pyrotechnics (if required) for that all important midnight strike! All our DJs come with full public liability insurance and are CRB checked. We also hold our own PPL and PRS licenses for those venues that do not hold them. If you would rather just have a go at being a DJ for the night, why not hire the equipment from us. We will supply you with everything you need for your party, whether you choose CD, vinyl, laptop or iPod. Just call our team who will be happy to discuss your requirements. We can also deliver it, set it up and pack everything away for you! Please note, if you wish to hire, it is advised to book early as equipment tends to be reserved very quickly. So don’t miss out, call us today to book your party as spaces will become limited, or simply fill in our quick quote. Book by the 7th November and receive 10% discount! Kick It Entertainment LTD accepts personal/company cheques, all major credit and debit cards and now PayPal. On behalf of Kick It Entertainment, may I take this opportunity to wish you a merry Christmas and a Happy New Year. Kick It Entertainment are proud to support new and upcoming bands. Charly Vox is a young and diverse band who live locally. Mention this offer when making your booking to receive your discount on your first equipment hire with Kick It Entertainment. We are always on the lookout for new DJ talent. If you would like to join our team please fill out the form below and we will contact you.